“…and if we could capture it, put it under glass, keep dampness from tamping its restless tranquility. What then? Every storm has brilliance, Dustin; has beauty when you look at it from a distance. It blurs all those incessant imperfections we seek to hollow out with each of our hopes. But when you step into its still center, when you see its fury and its power, you also see its beauty; its grace. Five thousand miles away and I can still feel your turbulence on my skin, Dustin; your grit stuck in the chambers of my heart…and all the silence that has followed it. Listening to Dust by Brandon Shire is a devastatingly beautiful and emotionally powerful love story of a magnitude that is at times overwhelming. It is not often that I find myself without the ability to articulate my thoughts in a review because the writing has rendered me so. This is such a story and I am not altogether sure if this review can or will do the writing justice. There are three main protagonists in this story. Stephen Dobbins a thirty-six year-old ghost-writer born in England and raised in Aix-en-Provence, France by his grandmother after his parents are murdered. Stephen has always felt guilty, thinking that his homosexuality caused their death and has led a relatively lonely existence until he meets Dustin Earl. Dustin joined the military to escape his American small southern town upbringing with the hope that he could give his mentally challenged brother, Robbie, a better life. But Dustin had never known real love, an honest hug, or a simple kiss. He considered his sexuality a weakness that had been used as a threat against him and those he cared about. For eight months Stephen and Dustin’s relationship blossomed until Dustin returned home. While he cherished Stephen, he felt his responsibilities to his brother outweighed his own chance at happiness. Shattered, unable to function and unwilling to accept Dustin’s departure, Stephen travels across the ocean to get Dustin back. But what he learns upon his arrival he could never have imagined. Listening to Dust is Mr. Shire’s second novel and in it he once again illustrates his inimitable talent as a storyteller. His writing is often appropriately described as lyrical and poetic and in this instance is characterised by exceptional prose, an incredibly intimate first person narration through the character of Stephen, a winding plot and a fluidity that allows for a seamless non-linear unfolding of the story. Stephen’s rich first person narrative accounts for his and Dustin’s characterisation providing insight into their relationship, respective pasts and family life; Stephen’s loneliness and his quest to find answers for his parents’ murder; and the responsibilities and burdens of Dustin’s life. This narrative is complemented by a series of beautifully written love letters from Stephen to Dustin. The letters so honestly convey Stephen’s feelings of longing and loneliness as a result of Dustin’s departure that his pain is palpable to the reader. Equally outstanding in this novel is Mr. Shire’s writing of dialogue and in particular how the dialogue uniquely provides for a superb portrayal of the character of Robbie. On the surface Robbie is reminiscent of Steinbeck’s Lennie, but it is his childlike purity of spirit, unfiltered openness and his eerie perception and wisdom that render this character unforgettable. While the reader cannot escape the pathos of Stephen and Dustin’s love story, it is the character of Robbie that seized me from the very beginning of the novel and did not let go. Recently, Mr. Shire posted on his blog of the many reasons he writes LGBTQ fiction none of which he admits revolve around becoming a famous published author. Listening to Dust exemplifies Mr. Shire’s commitment to providing a voice for the voiceless by writing with sincerity and emotional integrity fictional stories that deal with the multitude of real issues faced by LGBTQ people. While the story takes place in the here and now, it unfortunately exudes a feeling of timelessness. Unfortunate because the hatred and homophobia experienced in this novel should belong in history, to another place and time where insularity, ignorance and intolerance characterise the dust bowl existence of a small American southern town some fifty years gone. Through this fictional account Mr. Shire reminds the reader that hatred and homophobia continue to shatter lives in the present. Listening to Dust is an exquisitely written, tragic and haunting story that I will not easily forget and cannot recommend enough. Mr. Shire’s first novel, The Value of Rain, made my list of the best in LGBTQ fiction for 2011 and without question Listening to Dust will be part of my reading best for 2012. 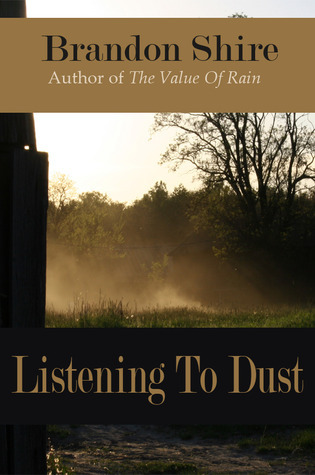 Listening To Dust by Brandon Shire is available in print and ebook formats at Amazon, Smashwords and through Indie Bound. This entry was posted in Fiction, Indie Reviews, LGBTQ, Literature and tagged Brandon Shire, CreateSpace, TPG Books by Indie Reviews. Bookmark the permalink. Once again you stun me with your review of my work. Thank you for this beautiful review. Brandon, the gratitude is all mine. Thank you for this beautiful love story and your words.